The Federal Point Historic Preservation Society held its monthly meeting on Monday, November 15, 2010 at 7:30 pm at the Federal Point History Center, 1121-A North Lake Park Blvd., adjacent to Carolina Beach Town Hall. “A Day of Blood” proclaimed Raleigh’s News and Observer about the events of November 10, 1898. On that date, white rioters in Wilmington murdered blacks in broad daylight and overthrew a legitimately elected Republican government without opposition by the public or intervention by the authorities. Our speaker this month was LeRae Umfleet author of Day of Blood: The 1898 Wilmington Race Riot. 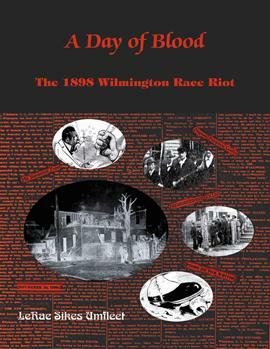 This thoroughly researched, definitive study examines the actions that precipitated the riot; the details of what happened in Wilmington on November 10, 1898; and the long-term impact of that day in both North Carolina and across the nation. Ms. Umfleet joined the Department of Cultural Resources in 2003 as a research historian in the Research Branch of the Office of Archives and History. While in that office she completed an extensive report on the 1898 Wilmington Race Riot, which became the basis for A Day of Blood. LeRae was later promoted to serve as the Chief of Collections Management for the agency. In her new capacity, LeRae manages how the agency cares for, collects, stores, and exhibits the objects in its custody. LeRae also manages the NC Connecting to Collections project, an IMLS grant-funded initiative.